A poison is any chemical that kills or injures an organism. The term toxin refers to a poison produced by a living organism, such as a microorganism, a plant, or an animal. In everyday practice, the terms poison and toxin are often used interchangeably. It is important to understand that any chemical is potentially poisonous. All that is required for a chemical to cause toxicity is a dose large enough to cause some harmful effect. For example, water could be considered toxic if a person drank four gallons of it all at once. In such a case, the water would cause serious bodily harm—even death. In a large quantity, then, water could be classified as a poison. The term toxicity is used to express how poisonous a chemical is. Scientists distinguish between two kinds of toxicity: acute and chronic. Acute toxicity refers to the amount of damage caused by a chemical after a short-term exposure to a large dose of the chemical. For example, a person might accidentally swallow a tablespoon of rat poison. The effects caused by that accident would be described as the chemical's acute toxicity. Scientists have various ways of measuring the acute toxicity of a chemical. Perhaps the most common is called LD 50 . The abbreviation LD 50 stands for "lethal dose, 50 percent." It is the amount of the chemical required to kill one-half of a population of organisms in a short period of time. Acute toxicity: A poisonous effect produced by a single, short-term exposure to a toxic chemical, resulting in obvious health effects and even death of the organism. Chronic toxicity: A poisonous effect that is produced by a long period of exposure to a moderate, less-than-acute dose of some toxic chemical. Exposure: The concentration of a chemical in the environment or the accumulated dose that an organism encounters. 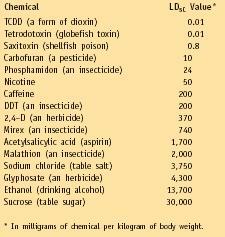 LD 50 : The amount of a chemical required to kill one-half of a population of organisms in a short period of time. Some chemicals cause effects that are difficult to observe over a short period of time. These effects are referred to as chronic toxicity. For example, a person who works with the mineral asbestos runs the risk of developing various respiratory disorders late in his or her life. Such disorders include emphysema, chronic bronchitis, and lung cancer. These disorders may not show up for many years after exposure to asbestos. Thus, they are known as chronic effects of exposure to a poison. In humans and other animals, long-term chronic toxicity can occur in the form of increased rates of birth defects, cancer, organ damage, and reproductive problems, such as spontaneous abortions. In plants, chronic toxicity can often be recognized in terms of decreased productivity (in comparison with plants that are not chronically exposed to the toxic chemicals in question). Because they develop over very long periods of time and are often difficult to recognize in their early stages, chronic toxicities are much more difficult to detect than are acute toxicities. * In milligrams of chemical per kilogram of body weight. For every poison, there is a certain threshold of tolerance below which no harmful effect is likely to occur. For example, the threshold for a particular chemical might be 5 milligrams of the chemical per kilogram of body weight. If a person is exposed to less than 5 milligrams of the chemical per kilogram of body weight, no harmful effect is likely to occur. If the exposure exceeds that amount, then the symptoms of poisoning begin to appear. Many poisonous chemicals are present naturally in the environment. For example, naturally occurring elements such as arsenic, mercury, lead, and cadmium are toxic in various concentrations to both plants and animals. Areas where these elements occur in large concentrations are usually barren of plants and animals. Other naturally occurring toxins are substances produced by plants and animals. In many cases, these toxins are part of a plant or animal's natural defense system, protecting them from other plants and animals that prey on them. One such example is the chemical tetrodotoxin, synthesized by the Japanese globefish ( Spheroides rubripes ). Tetrodotoxin is extremely toxic even if ingested in tiny amounts. Only slightly less toxic is saxitoxin, synthesized by species of marine phytoplankton but accumulated by shellfish. When people eat these shellfish, a deadly syndrome known as paralytic shellfish poisoning results. There are numerous other examples of deadly biochemicals such as snake and bee venoms, toxins produced by disease-causing microorganisms, and mushroom poisons. In the modern world, humans are responsible for many of the toxic chemicals that are now being dispersed into the environment. In some cases, human actions cause toxic damage by emitting large quantities of chemicals that also occur naturally, such as sulfur dioxide, hydrocarbons, and metals. Release of these chemicals as the result of human activities only increases the severity of problems that may already exist because of the natural presence of these chemicals. Humans, however, also produce and release to the environment large quantities of chemicals that do not occur naturally. These synthetic (made in a lab) chemicals include thousands of different pesticides, medicines, and various kinds of industrial chemicals, all of them occurring in complex mixtures of various forms. Many of these chemicals affect humans and other organisms directly, as is the case with many pesticides. In other cases, toxicity occurs indirectly. An example is the class of compounds known as the chlorofluorocarbons (CFCs). Normally these chemicals are quite inert (inactive). However, when they find their way to the upper atmosphere, they break apart into simpler chemicals that consume ozone, the gas that protects life on Earth from harmful ultraviolet radiation. As a result, the risk of disorders such as skin cancers, cataracts, and immune disorders greatly increases. In an attempt to control the effect of highly toxic chemicals, 122 nations met in late 2000 and agreed to a treaty calling for the global elimination of 12 chemical pollutants. Environmentalists have called these the "dirty dozen." The twelve include eight pesticides (aldrin, chlordane, DDT, dieldrin, endrin, heptachlor, mirex, and toxaphene), two types of industrial chemicals (hexachlorobenzene and polychlorinated biphenyls or PCBs), and two types of industrial byproducts (dioxins and furans). These toxic pollutants were chosen not because they are the most dangerous, but because they are the most widely studied. The treaty must be ratified by 50 nations before it can take effect. It was quite interesting. I'll like to suggest that more write-ups on specific plants which contain toxic substances and the antidots to such should be included.THANKS. I was wondering if there is someone who could tell me about the chemical/poision known as Lance? I'm not too sure if that is the right name, but it is suppose to be a white powder, and it kills within seconds of smelling or tasting. It was once used to kill police when they "tested" drugs on the street. And as Chris said, Lance is an interesting drug. How poison kills the life of the human? Is poison kill human by blocking the ETS (electron transport system) of the body? I started out reading the ethics involved in recycling. In one article the author stated that we are past saving the earth from all the damage we as humans have done. This made me think of all the waste and toxic waste that nature makes on earth, and thats what brought me to this link. I'm mostly just curious to know if mankind is powerful enough to destroy something as big and as powerful as earth and nature? After all, mother nature has created all these natural poisons(which earth uses to defend itself) and poisonous animals( which they use to defend themselves) and all are used not really knowing that it can harm other plants/animals/people. It is just a defense mechansim. Maybe mother natures way of protecting the earth as a whole is by mankind causing so much damage so that the earth can defend itself with natural disasters, such as global warming, in order to take care of population control. We have long since discovered there is no predicting mother nature, so why should mankind think that they can destroy earth? It just proves how egotiscal mankind can be. My son had contact with "Russian Nine" in Iraq. It was wet, which I understand this is why he isn't dead. He was a civilian in the beginning, and then was "drafted" into service. His legs, below the knee are very dark, brown and patchy. Some toes are very dark. I need to know what kind of doctor he needs to see. I am guessing a Hematologist, is this correct? He is listed as a non-civilian, but is not able to go to a VA Hospital. It is impossible to get all the paper work needed. Thank you for any information you can give me.